Therefore, it’s both topical and fitting that prisoners suffering under intense brutalisation on the other side of the Atlantic are being inspired by Bobby’s unyielding spirit as they fight back against injustice. My friend and comrade, Denis O’Hearn, who wrote a wonderful biography of Bobby Sands and who is a renowned prison activist, described a special event he attended in March last year. It was in Ohio state prison, that two ‘death row’ prisoners celebrated the former MP’s 60th birthday. These were Bomani Shakur and Jason Robb, along with three others, who are awaiting execution for their parts in a prison uprising in Lucasville, Ohio in 1993. There is no evidence that any of the five was involved in any killings that took place during the uprising but they led a movement to convince prisoners not to inform on other prisoners regarding any events that took place during the uprising. Bomani and Jason were offered deals by the state of Ohio to get very reduced sentences if they testified against other prisoners but they refused to do so and chose to save their souls at the possible cost of their lives. As punishment, the state fabricated evidence of guilt and withheld evidence of their innocence and stage-managed a series of trials that resulted in death penalties. The five men remain steadfast friends and comrades. Two are white, two black, one a Sunni Muslim. They bought a small cake from the vending machine in the visiting room. Jason, who is an accomplished artist, used the crayons and paper from the childrens play area of the visiting room to make birthday cards reading “Happy Birthday Bobby” and “Always Remember.” He constructed a birthday candle from paper, with a “flame” on the top, to decorate the cake. Together we celebrated Bobby’s life and his ongoing contribution to freedom everywhere. 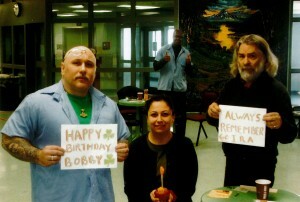 After the victorious hunger strike in Ohio, other prisoners around the United States read about Bobby and the Irish hunger strikers. Last year 30,000 men in California’s prisons went on hunger strike against solitary confinement. They organized the strike from a small area of isolated confinement called the short corridor that resembles nothing so much as the H-Blocks at their height of inhumanity, although these men do not even have windows in their cells. The men who organized the strike are African-American, Latino, and White. According to one recent report the men held all kinds of lively debates in their “pod” in Pelican Bay State Prison, but whenever the subject of Bobby Sands and the Irish hunger strikes came up the talk changed. “Every time we’d start talking about it, we’d notice the pod going quiet—we knew people were listening,” The state says that they are leaders of gangs that are at war with each other yet they have shown the deepest comradeship. The hunger strike lasted some 60 days and it may resume again if rights are not granted. Last month, dozens of prisoners in Menard “administrative segregation” (solitary) unit in the state of Illinois went on a hunger and then thirst strike for their rights. Again, they cited the example of Bobby Sands who, among others, has been responsible not only for politicizing large segments of the US prison population but for showing them a way that they can fight for their rights through nonviolent resistance. Prison activists believe that there will be a nation-wide hunger strike in US prisons to protest against the inhumane policy of long-term solitary isolation, which since 1983 has put tens of thousands of men into total solitary isolation, some of them unable to touch another human being for decades. Is iomaí Gael agus díograiseoir forásach ar fud an domhain a bheas ag tarraingt spreagtha agus uchtaigh ó chuimhne chumhachtach an stailceora ocrais Bobby Sands an tseachtain seo agus muid ag comóradh trí bliana is tríocha ó thug sé a bheatha ar son saoirse na hÉireann agus domhan níos cothroime. Ach is tráthúil agus féiliúnach go bhfuil príosúnaigh faoi bhrúidiúlacht mhillteanach ar an taobh eile den Atlantach ag baint tairbhe as teachtaireacht neamhgheilliúil Bobby agus iad ag streachailt in aghaidh na héagóra. Rinne mo chara Denis O’Hearn, a scríobh an bheathaisnéis iontach ar shaol Bobby Sands agus atá ina ghníomhaí príosúin aitheanta, cur sios ar imeacht speisialta ar fhreastail sé air siar i mí Mhárta na bliana seo. Is i bpríosún stáit Ohio a rinne beirt chimí ‘sraith an bháis’ 60ú ceiliúradh breithlae in ómós d’iarfheisire parlaiminte Sands. Is iad Bomani Shakur and Jason Robb agus triúr eile, atá bású i ndán daofa mar gheall ar ról s’acu in Éirí Amach in Lucasville, Ohio in 1993. Níl fianaise ar bith a cheanglaíonn ceachtar den chúigear do na máruithe a thit amach le linn an éirí amach ach gur threoraigh siad na príosúnaithe gan aon eolas a scaoileadh leis na húdaráis fán mhéid a tharla i rith na n-imeachtaí. Rinne stát Ohio beart a thairiscint do Bomani and Jason le téarmaí príosúntachta laghdaithe dá mbá rud é go raibh siad sásta sceitheadh ar na príosúnaithe eile ach dhiúltaigh siad agus d’fhulaing siad píonós neamthrócaireach mar gheall air. Mar phíonós, chum an stát fianaise ciontachta ina n-éadan agus rinne siad fianaise eile a léirigh soineantacht s’acu a choinneáil faoi cheilt, rud a chiallaigh gur chríochnaigh an triail leo bheith daortha chun báis. D’fhan cairdeas buan idir an cúigear fear ó shin i leith. Beirt fhear geal, beirt fhear gorm agus Moslamach Sunnaíoch amháin. I mí Eanair 2011, faoi thionchar ó stailceanna ocrais na hÉireann in 1980-81 agus scéal Bobby Sands, chuaigh triúr acu ar stailc ocrais ag éileamh teagmhála lena chéile agus cuairteanna oscailte a thug deis daofa lámh a leagan ar chairde agus ar theaghlaigh s’acu. D’éirigh leis an stailc, ainneoin go mbíonn Bomani agus Jason glasáilte don tábla le linn na gcuairteanna seo. Is mar gheall ar an bhua seo go raibh Denis O’Hearn agus an bheirt phríosúnaithe ábalta cáca mílis a ghlacadh isteach ón seomra cuairteanna chun saol streachailte Bobby Sands a cheiliúradh. Rinne Jason, atá ina ealaíontóir éirimiúil, cárta agus coinneal breithlae leis an mhana, ‘Happy Birthday Bobby’ agus ‘Always remember’, in ómós d’iarrachtaí cróga an stailceora ocrais. Spreag an stailc ocrais rathúil seo in Ohio, príosúnaithe eile ar fud na Stát Aontaithe chun suim a chur i streachailt Bobby Sands. Anuraidh, chuaigh 30,000 fear i bpríosúin California ar stailc in aghaidh gaibhniú aonair. D’eagraigh siad stailc s’acu ó dhorchla cúng atá comhchosúil leis na blocanna H ar bharr a réimeas mídhaonna, bíodh is nach bhfuil oiread is fuinneog sna cillíní ina bhfulaingíonn siad. Mhair an stailc ocrais 60 lá agus tosóidh sé arís muna gcomhlíontar éílimh s’acu. Deirtear gur sampla Bobby Sands agus stailceoirí ocrais na hÉireann a rinne polaitiú ar sciaranna móra don daonra príosúntachta i Méiriceá tríd taispeáint daofa gur féidir modhanna síochánta a úsáid chun troid ar son a gcuid ceart.